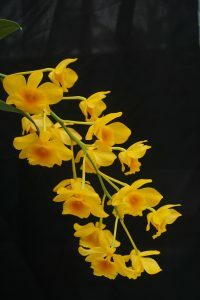 Another yellow dendobium today and one we have seen growing in southern Laos. 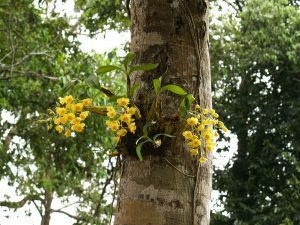 Dendrobium chrysotoxum is native to seasonally dry forest monsoon forests and we found it in several locations at around 1000m around Paksong on the Bolaven Plateau. Plants were mostly growing on the trunk and lower branches of large trees in good light as shown on the photo below. 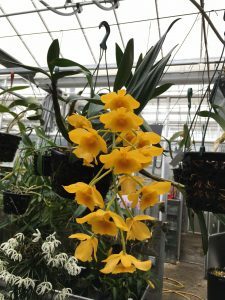 In cultivation we reflect the natural habitat by growing plants warm and wet in the summer in Warm Asia but give a cooler and much dryer winter in the top of Cool Americas. We find that baskets are ideal for this rewarding species.